MERCEDES, TX--FEBRUARY 12, 2018--AQHA Racing World Champion sire Winners Award SI 99 is joining the stallion roster at RGV Equine Services Rio Rico Ranch near Mercedes, Texas. His 2018 fee has been set at $800 with stakes and multiple mare discounts. The son of former leading sire Runaway Winner had stood in Canada most recently. He is owned by the Winners Award Partnership. From a limited number of starters, in nine crops to reach racing age, Winners Award is the sire of 40 winners, 7 stakes horses, 1 world champion with earnings in excess of $1.4 million and average earnings per starter of more than $19,100. Ba Lucky Penny SI 90 (2 wins to 5, $32,062 3RD Ontario Sires S. Derby, etc. ), etc. 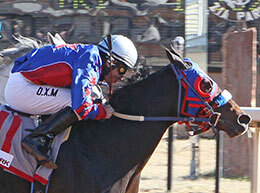 1st-TQHA Sires' Cup S., 3rd-Dash for Cash Derby(G1), Finalist in Ruidoso Quarter Horse Futurity(G1), Finalist in Texas Classic Derby(G1), Finalist in Ruidoso Derby(G1), Finalist in All American Juvenile Invitational(G3), Finalist in TQHA Classic S.(G3), Finalist in West Texas Juvenile Invitational, Finalist in Santa Rosa H.